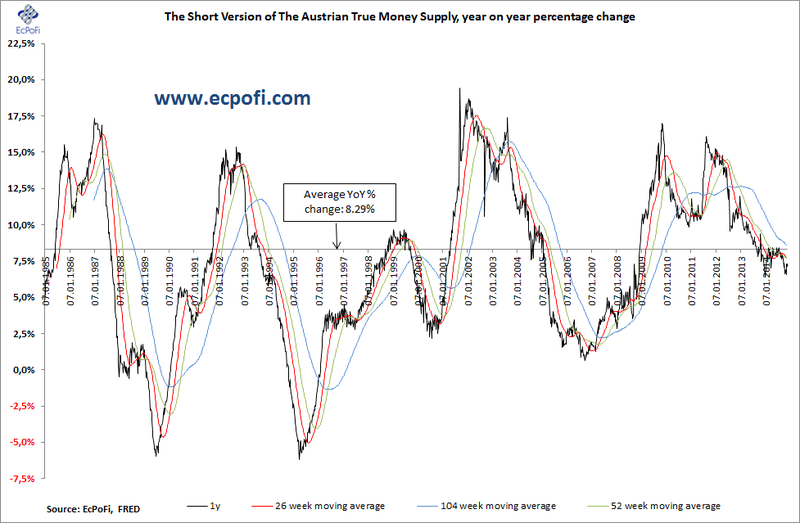 The short version of the Austrian True Money Supply for the U.S. decreased 0.59% on last week for the week ending 24 November 2014. At $10.3977 trillion, the money supply is now up $514.4 billion, or 5.20%, year to date. The 1-year growth rate dropped to 7.13%, the lowest reported for three weeks and 77 basis points lower than at this time last year. 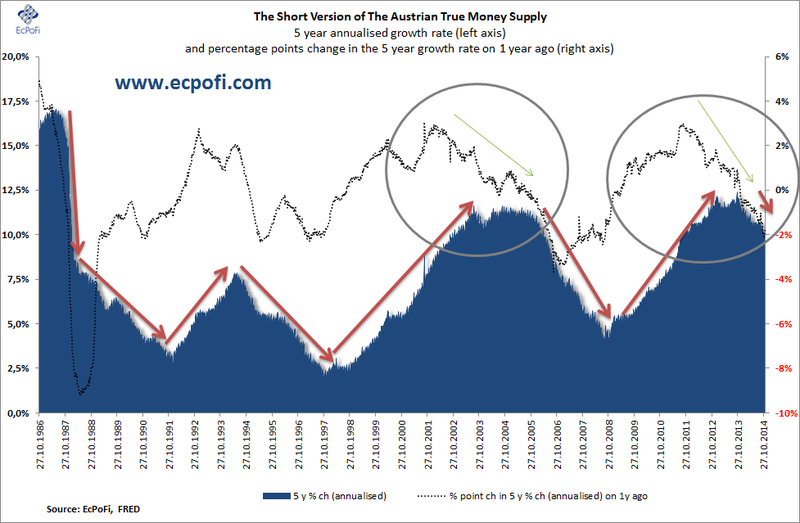 The 5-year annualised growth rate in the money supply continues to head nowhere but down and this week it fell below 10% for the first time since 31 October 2011. 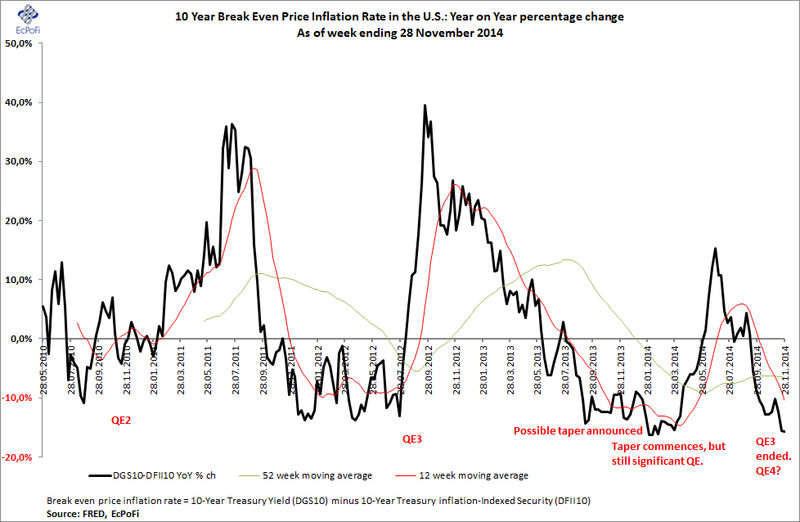 Compared to one year ago, the growth rate shred 174 basis points. The growth rate has now declined for 52 consecutive weeks, something which has not happened since week ending 24 July 2006. 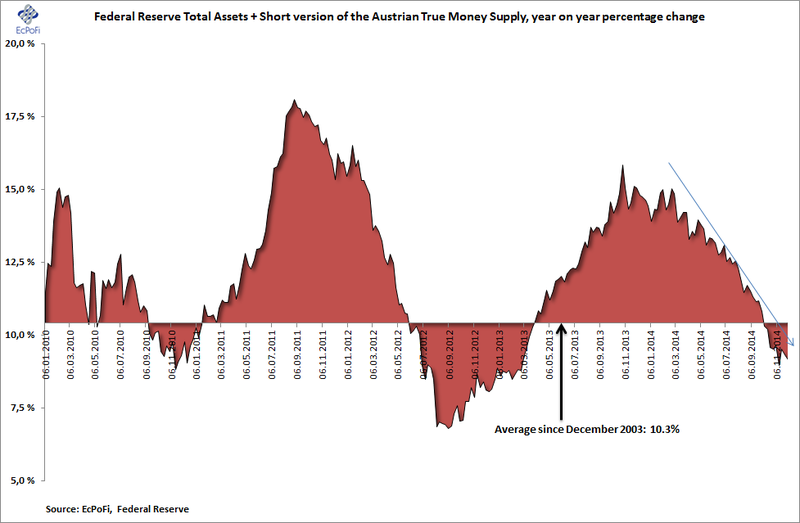 ...and as the growth rate in the Fed assets plus the money supply has been plummeting at great speed during the whole of 2014. 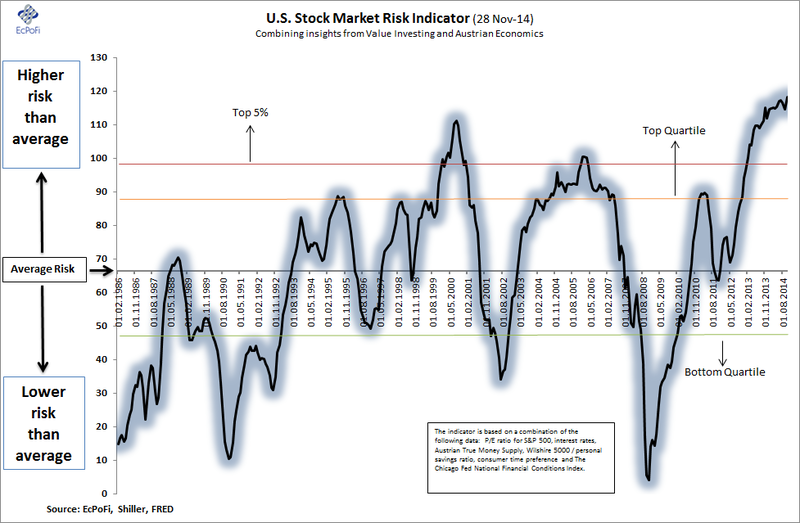 ...the deflationary pressures facing the U.S. economy has helped the U.S. stock market risk indicator climb to levels not previously seen during the last three decades or so. We have been led to the old principle that the investor should wait for periods of depressed business and market levels to buy representative common stocks, since he is unlikely to be able to acquire them at other times except at prices that the future may cause him to regret. This is a principle long term buy and hold investors would be wise to remember. But what we see now differ somewhat from what Graham and Dodd was pointing to: the stock market has been booming even as the economy and the prospects for economic improvement, in my opinion, have been deteriorating. A plethora of government spending since the 2008 banking crisis has fueled unsustainable spending in a range of sectors which are likely to face headwinds while the stock market has been pushed up by inflated earnings and market multiples (e.g. 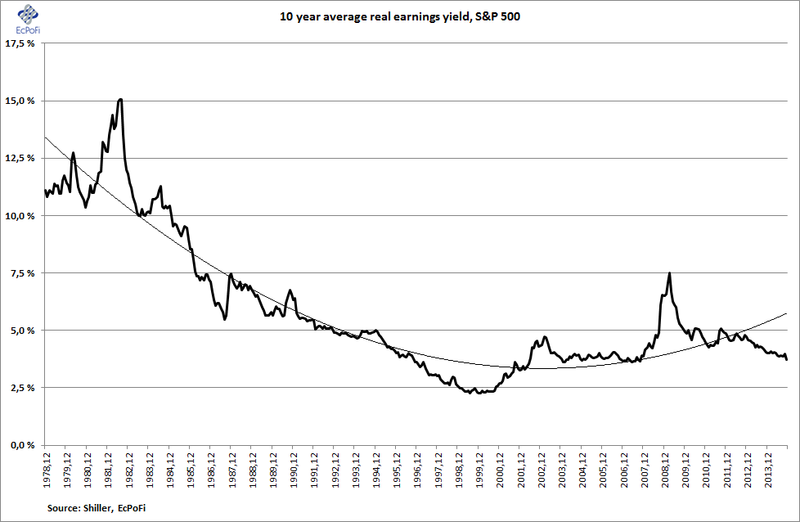 P/E ratio), both unsustainable absent further expansion of the money supply growth rate. Though the Graham and Dodd value investing philosophy does not lend itself effectively as a timing tool, it works very well at stock market extremes in my opinion. We are now at one such extreme, an extreme which has arrived at the cost of future returns.